OK, my very first step in this project is full of other noteworthy firsts – the first time setting up a blog with pictures, the first time shooting manually with a DSLR camera, and the first time cooking with caul fat. So, you know. Bear with me. Abkhazia is a contentious place to begin, since it is only considered an independent political entity by Russia, Nicaragua, Venezuela and a few unrecognized states. It’s a good thing, then, that this is a food blog, and will therefore remain diplomatically immune to such limiting socio-political quandaries. Researching Abkhazian cuisine was actually easier than I thought it would be – it’s largely a regional variety of Georgian cuisine, and because of this I managed to find a surprising selection of recipes (as always, sources will be listed below), from which I chose three. The recipes for achma that I found specifically called for two complementary cheeses, with the stipulation that one of them be something brined, akin to a feta, Bulgarian or otherwise. A bit more research revealed that a version widely available in Georgia would be bryndza, and that this would match quite well with something softer and milder, like suluguni. I personally found raw bryndza to be mellower and less chalky than Bulgarian or Greek feta. The suluguni had the consistency of mozzarella, but with a strange flavor that was less like milk and more like sour cream. 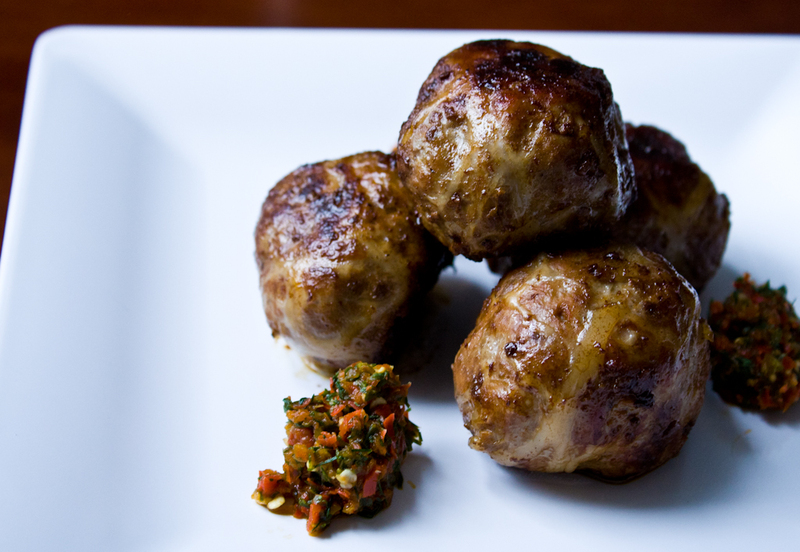 While I was in M&I, I also grabbed some blue fenugreek, which is a variety of fenugreek native to Georgia (utskho suneli) and necessary for the second dish I was making, abkhazura – richly spiced pork-and-beef meatballs, wrapped in caul fat and browned slowly in a pan. 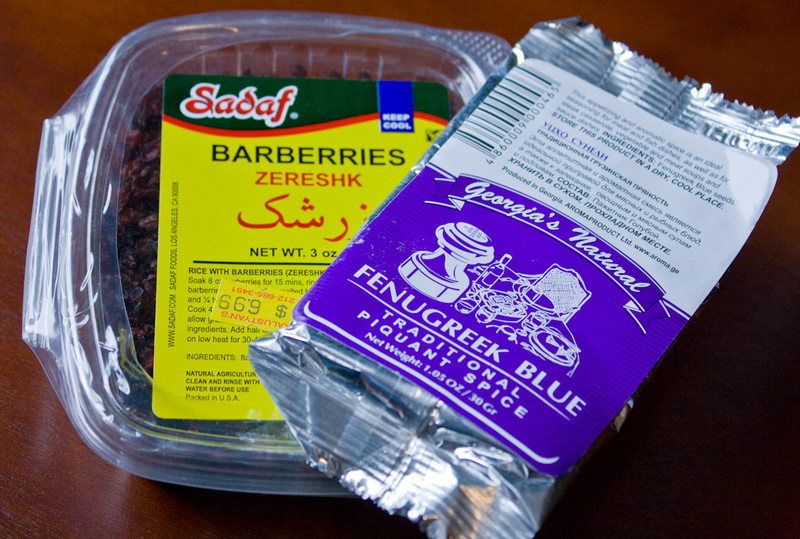 A quick stop at Kalustyan’s for dried barberries was also necessary. Once I was back in Astoria, I found some caul fat at Plaza Meat Market on 31st Street – the Cypriots in the neighborhood (that’s a lot of people) use it to make their own speciality, seftalia. The recipes I found for abkhazura were, unfortunately, all copies of the exact same Ur-recipe that is smeared across the internet, so it was difficult to cross-check its accuracy, but all the elements looked right so I went ahead and prepped them. If you’ve never cooked tripe or stomach-y parts before, you should be aware that when they are raw, and sometimes after they are cooked, they stink to high heaven – it’s this bilious, innardy, barfy aroma that cannot be mistaken for anything else. But I digress – while the caul fat had been odoriferously steeping in warm water and vinegar, which made it pliable and easy to separate, I had rolled out some sheets of fresh pasta for the achma (recipe below), quickly boiled and shocked them in ice-water, and guiltily assembled layers of crumbled cheese, melted butter and the noodles in a casserole dish. That went into the oven, and the fat-wrapped meatballs went into a big pan. 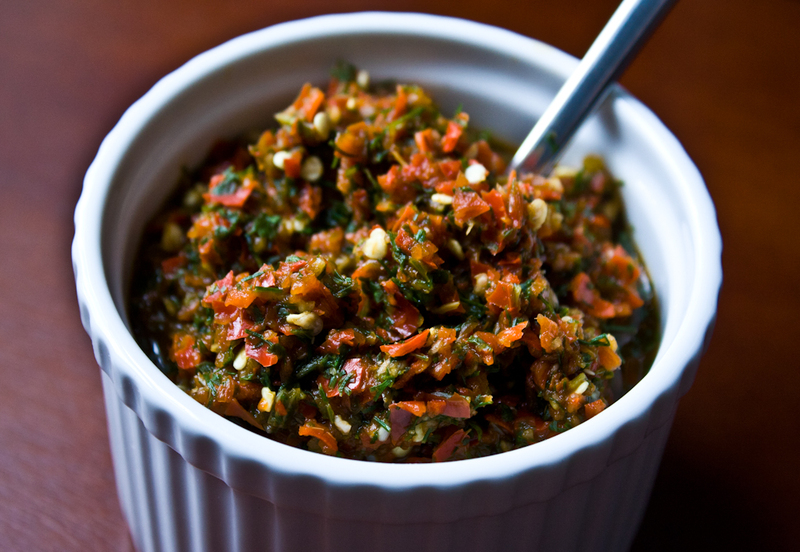 While that stuff was cooking, I quickly put together an Abkhazian condiment called adjika. The wiki specifies that the variant served in Abkhazia is boiled, but, again, more information was not available, so I thought hard and then briefly boiled only the peppers and celery (since boiled dill and cilantro seemed pretty wrong to me…), drained them and processed them with the rest of the ingredients (see recipe below, duh) to make a coarse paste. By this point the abkhazura looked great – the caul fat had rendered down and gotten a little crispy, and the very new-to-me smell of the spices in these things had completely filled my little apartment. I was dying to eat them. After finishing the achma under the broiler for a couple of minutes, I served myself up a nice-looking and ridiculously good-smelling dinner. Honestly, the abkhazura needed a little more oomph in the spice department, despite the heady aromas that they had emitted during cooking – for this, I’ve adjusted the recipe below to be a little more flavorful. They were also rather dense, since they are all meat and contain no filler, like breadcrumbs or flour. I was happy to note that the gamey texture of the caul fat had departed, leaving only a rich, tongue-coating fattiness. The adjika was also different than I had expected – maybe I got a bum batch of peppers, but it had no heat at all, though the salty-pickled taste went extremely well with the abkhazura. The real winner here was the achma. 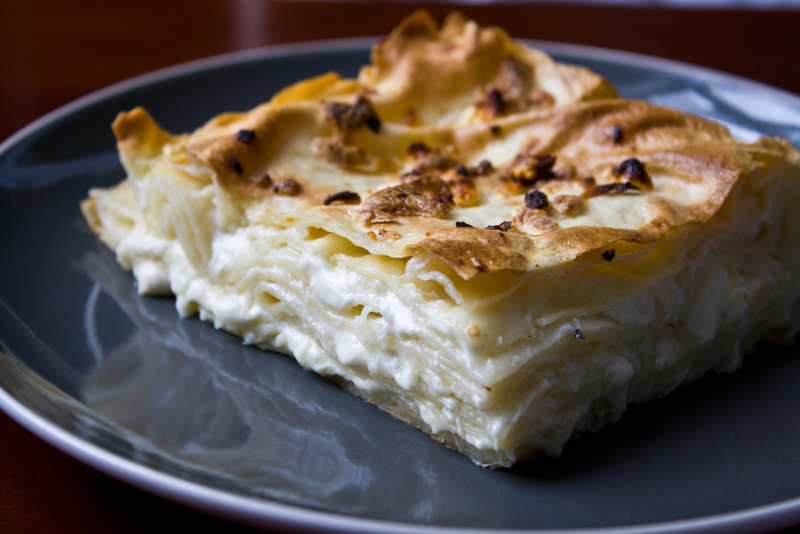 It was soooooo buttery and rich, yet somehow impossibly light and airy – the top layer, which had been crisped under the broiler, crackled under my fork while the layers below oozed out delicious molten bryndza and suluguni. I ate way too much of this. 1) In a large bowl or on a wooden board, mix the flour, salt and eggs until they form a loose dough. Add the milk, knead for 2 minutes. Form into a ball, cover and let rest for 1 hour. 2) Divide dough into 8 pieces. Flour well, and, with a pasta machine, roll each piece to the next-to-finest setting. (With a rolling pin, roll to the thinnest humanly possible.) Each sheet should be as thin as a crepe. 3) Boil, shock in ice water and drain each sheet of pasta. Combine cheeses in a bowl and mix well. Grease a Pyrex pan with some of the softened butter, and begin layering as follows: pasta, a brushing of butter, pasta, 1/3 of the cheese. Repeat until you reach the top of the pan. Sprinkle remaining cheese and drizzle a little butter on top. 4) Bake at 400 degrees F for 30-35 minutes, then finish under the broiler for 2 minutes or until well-browned. Let cool slightly, then serve. 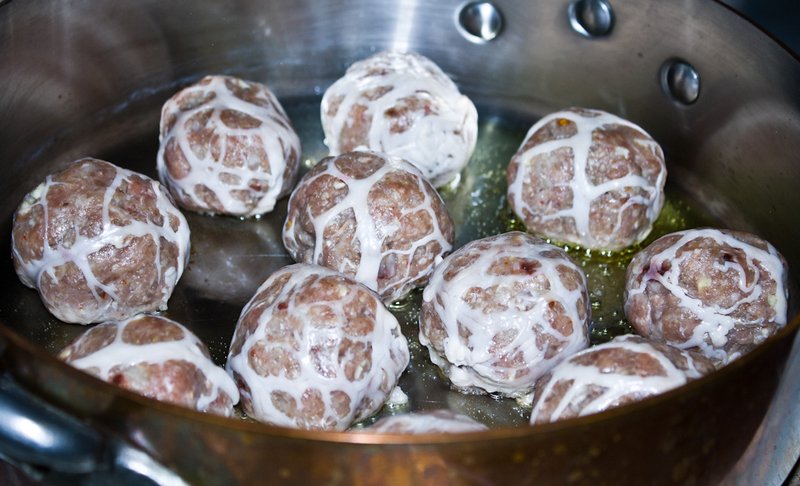 1) Soak the caul fat in lukewarm water with a splash of vinegar until it separates and becomes pliable. Gently rinse very well to remove any debris, dirt, oats (yes, I said oats) or anything else you find in there. 2) Combine pork, beef, onion, garlic and spices in a large bowl. Mix well with your hands until everything is incorporated. 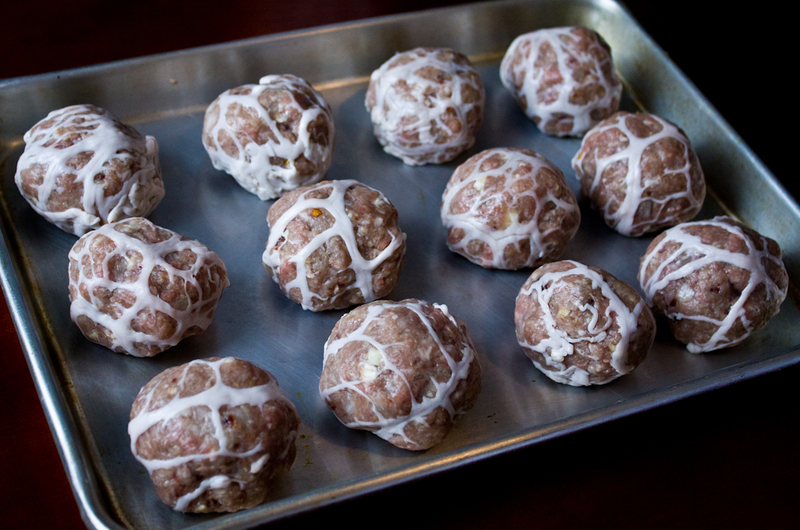 3) Working one-by-one, form meatballs a little bigger than a golf ball and wrap each in a 4×4 inch square of caul fat. Choose sections that have thinner, sparser fat – nothing chunky or heavy. 4) Fry in a deep pan with olive oil over low heat at first, gradually increasing to medium as they take shape and the caul fat renders, until they are nicely browned on all sides. Serve with adjika. 1) In several cups of boiling water, combine peppers and celery. Boil for 5 minutes, until softened. Shock in ice water and drain immediately. 2) Combine all ingredients except vinegar and salt in a food processor and pulse until a coarse paste is achieved. Mix with vinegar and salt in a bowl, allow to sit for 30 minutes (or up to 3 days). I was wondering what you would recommend as a good substitute for Abkhazian sour cheese? Hi Heather, thanks for checking out my blog! 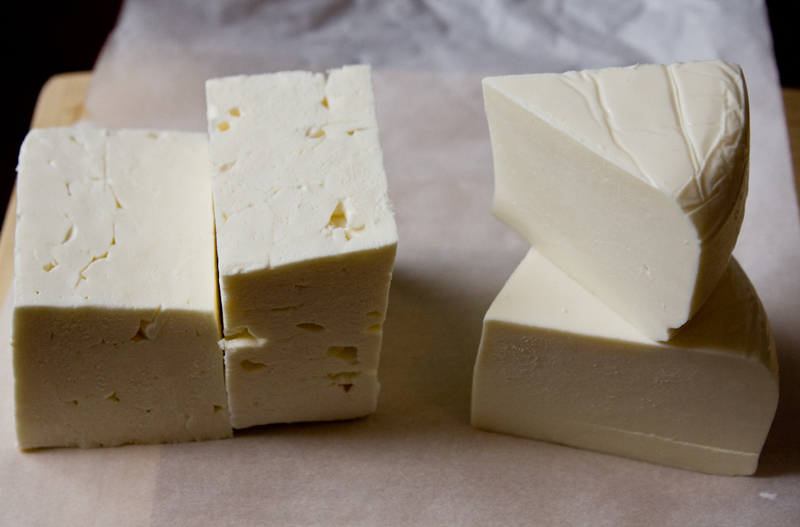 I’ve read that some people use feta in place of bryndza, and the closest thing to suluguni that I’ve ever tasted is probably Mexican Queso Oaxaca – stringy like mozzarella but a little drier. I would, however, advise against making any substitutions at all – what you come up with might be good, but it won’t be “achma”. Take a look around your area, there might a be a little pocket of Georgians (or Russians?) somewhere within a road trip’s distance!